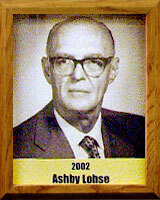 Ashby played football at Tucson High School and lettered in track at the University of Arizona. He was an outstanding international volleyball player and traveled with the YMCA national volleyball team for games throughout the United States and Mexico. The YMCA was an important part of his fitness regime, and the Lohse YMCA was named in his honor. A Tucson lawyer, Ashby was a strong believer in foundations and endowments. He was a person with the courage to commit, a person dedicated to his community and desirous of making it a better place. He was a passionate advocate for his clients. It speaks to his honesty and character when 17 of his clients left their entire estates to him to establish and run foundations in their names. His goal was to honor the memory of his clients by helping as many non-profit organizations as possible in this community.